The global automotive chassis systems market is characterized by increasing intensity of competition over the years on account of the demand for products with high-end components, finds Transparency Market Research (TMR). Top players in the automotive chassis systems market are increasingly focusing on constant technological advancements to meet the current demand. Recent industry initiatives include rising volumes of investments in research and development of high-performing automotive chassis sensors. TMR notes that several players are increasingly focusing on light-weight and more durable automotive chassis systems to meet wide diversity of emerging end-user needs. This has helped them gain a better foothold in the global automotive chassis systems. Some of the key prominent players operating in the automotive chassis systems market are ZF Friedrichafen, Magna International Inc., Benteler International AG, American Axle & Manufacturing, and American Axle & Manufacturing. 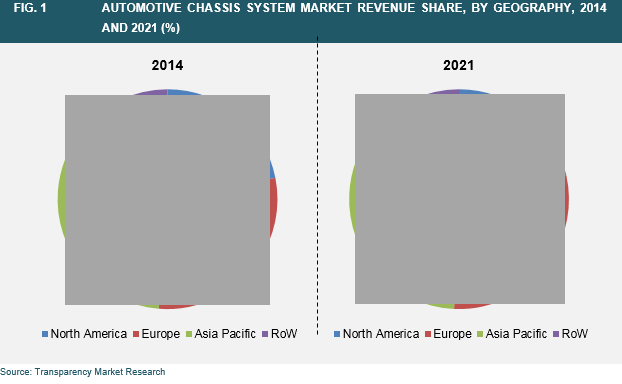 The global automotive chassis systems market stood at US$65.5 billion in 2014. Rising at a CAGR of 4.10% during 2015–2021, the global automotive chassis systems market is projected to reach a worth of US$86.4 billion by 2021 end. Among the various vehicle types, passenger cars have emerged out as the major consumer in the global automotive chassis systems market. The vast uptake automotive chassis systems in passenger cars is attributed to the large demand for advanced automotive in passenger cars. Among the various regional markets for automotive chassis systems, Asia Pacific has been the most attractive segment and it presently accounts for the major share. The growth is driven by burgeoning sales of construction equipment vehicles, HCVs, and LCVs in the region. The rising demand for luxury and premium vehicles in the emerging economies is boosting the regional market. The drive for lighter and stronger chassis system stems from the need for light-weight and fuel-efficient vehicles across the world. This is a key factor propelling the growth of the automotive chassis systems market. Over the past few years, there has been rising trend toward the incorporation of advanced components in the automotive chassis system. Rapid strides being made by construction and infrastructural developments in emerging economies across the world is a noticeable trend bolstering the demand for advanced automotive among vehicle buyers. This, in turn, is driving the demand for automotive chassis systems. The market has also benefitted in recent years from the growing adoption of sensors in automotive chassis that helps in detection of any malfunction in vehicles. The staggering rise in production of vehicles in developing regions, especially in Asia Pacific, is offering a large impetus to the market’s expansion. This trend is especially evident in economies of India, Japan and China. Rising popularity of cleaner and lighter vehicles is imparting a robust momentum to the growth of the automotive chassis systems market. Rising investments in research and development of high-end automotive in numerous developing and developed countries is a notable trend opening new, exciting avenues in the global market in the next few years. The study presented here is based on a report by Transparency Market Research (TMR) titled “Automotive Chassis Systems Market (Component - Suspension ball joints, Cross-axis joints, Tie-rods, Stabilizer Links, Control arms, and Knuckles and Hubs; System Types - Front axles, Rear axles, Corner modules, and Active Kinematics Control; Vehicle Type – Cars, LCVs, ICVs, HCVs, Off-road Vehicles, Construction Equipment, Defence Vehicles, and Farm Tractors) - Global Industry Analysis, Size, Share, Growth, Trends and Forecast 2015–2021”.